Ecological markets, communities, families and organizations take initiative on the issue of adequate food and the conscious use of natural resources. Photograph from the Kurtural website and used with permission. 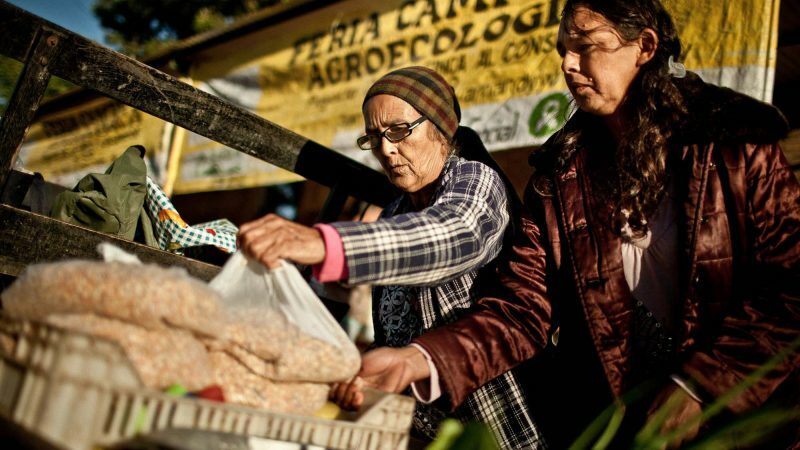 The #jakaruporahagua  series (meaning “to eat well” in the Guaraní language), published by the Paraguayan independent news site Kurtural, follows the movement with the same name and its fight for ethical land use and food consumption. What follows is an edited version of the series that will highlight some of the stories and the experiences they share. It will be published on Global Voices in three parts. As in many other countries and their urban centers, people are starting to think critically about land, food and health in Paraguay. 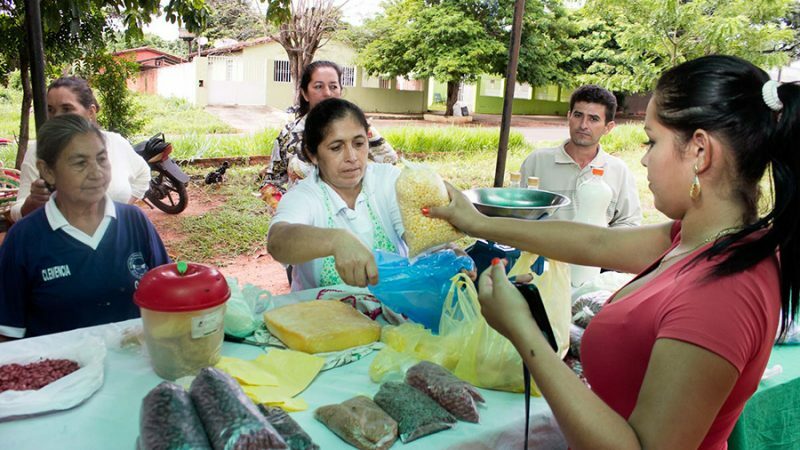 The economic model and the ideal of development that Paraguay has pursued has translated into Paraguayans living a fast-paced life and relying on food sources that take a toll on their health. Paraguayans are heavily dependent on supermarket products and ready-to-eat food high in sugar and carbohydrates, as well as vegetables to which many pesticides have been added. Their diet is also rich in meats and fat, since healthier and lighter products tend to be a lot more expensive. People look for the cheapest and tastiest way to fill their bellies. For many experts like Miguel Lovera — who was part of the National Service for Vegetable and Seed Safety and Quality  — this is the root of Paraguayans’ malnutrition and represents a failure in ensuring people's right to food security. Given this reality, a growing number of initiatives devoted to defending food and land rights have sprung up in Paraguay. Some of these projects study how to use the land in a responsible manner, and teach others how to do so. Others connect city residents, whose resources and access to whole foods may be limited, to farmer's markets, or develop food fairs in less populated areas and encourage local production for local consumption. I earned a lot of money but I had no life, it was only work and a lot of stress […] I came from another background and I had little experience. I was cutting my own path. I encouraged myself to have my little vegetable garden, I educated myself. The issue of health always interested me, my view on medicine differed from the Western vision and I understood that food is pure medicine. We had the idea of eating healthy with our daughter. That's how the project started, as a family initiative to provide to other families, and then it started spreading. They share the products they have available through Facebook and their website . They also have a mailing list. In 2016, Tu Kokue became a collective project and includes groups of urban farmers. So far, they have over 50 families buying their products weekly. Photo: Amadeo Velazquez. Used with permission. Some of the projects not only are concerned with creating healthy food communities and setting up farmer's markets, but also bring together groups whose interests also include the protection of the land, the peasantry and women in rural areas. Their efforts have contributed to a jump in touristic interest and therefore some economic growth in some areas, thanks to their food markets. One example is that of San Pedro del Paraná , in the south of the country (350 kilometers away from the capital, Asunción). Since 2007, over 50 families of agricultural producers from neighboring areas have flocked there to sell to around 2,500 people, who now wait for market day to buy their fresh products. The successful experience has led other communities to replicate the food fairs, making San Pedro the local reference in farmer's markets. Blanca Méndez, a member of the Pastoral Social de San Pedro del Paraná — a Christian institution that works with people in need in the city — says that thanks to their participation in this growing food market initiatives, the organization has gained economic independence and has been able to encourage the development of small family farms. In our next post, we'll be exploring tips and recipes shared in the series, and finally, we'll explore the challenges and the realities behind healthier eating in Paraguay and the organizations that are trying to make it possible.